We are a network of individuals, churches, Christian organizations and institutions who, inspired by the story of Coventry Cathedral in England, share a common commitment to work and pray for peace, justice, and reconciliation. We are committed to healing the wounds of history, learning to live with difference and celebrate diversity, and building a culture of peace. We maintain a supportive and collaborative relationship with the Reconciliation Ministry at Coventry Cathedral. The cathedral is committed to develop and enable the training and practice of reconciliation as an integral part of Christian worship, witness, and discipleship. The name Cross of Nails has its history in WWII when German bombs destroyed St. Michael’s Cathedral in Coventry. In the midst of the rubble, a priest took three large roofing nails forged in the Middle Ages and bound them with wire. 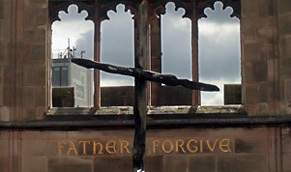 In the terrible aftermath that followed, Provost Howard wrote ” Father Forgive” on the smoke-blackened wall of the sanctuary. The cross of nails is a very powerful and inspirational symbol worldwide of reconciliation and peace. After the Second World War, crosses of nails were presented to Kiel, Dresden and Berlin, cities shattered by Allied bombing. Out of the ashes grew a trust and partnership between Coventry and the German cities. Today, there are almost 200 Cross of Nails partners around the world.